Part of the radio silence these past few days has been all of the knitting I have on the go- my hands are otherwise engaged making my knitting needles fly! The more projects I complete the more confident I am becoming as a knitter- I remember not to long ago writing a post about how I didn't consider myself to be a knitter but I so wanted to understand the language. I feel like I can now say I am indeed a knitter! One of the small items that has recently come off the needles is this wee little short sleeve cardigan for my little Miss. The perfect thing for these funny in between days of fall- a great layering tool. The pattern is In Threes and really was so simple it only took a week to complete. I seriously love this pattern so much and feel the need to figure out how to size this up so my girl can have another when she grows again! As we are deep in Slow Fashion October and one of my goals was to address my wool stash I pulled a skien bought long ago. I am not sure of the brand but it is the softest and silkiest wool I have worked with yet- obviously I loved the colour because I have 2 more skeins of the same shade! I think another benefit of Slow Fashion October is taking a look at my children's wardrobes with the same critical eye as I look at my own closet. I have started to focus my energies on building each of them a capsule wardrobe with easy mix and match garments that can transition between seasons which means getting the most wear out of a single item. Incidentally my little Miss is wearing her brother's hat from a past season- what I love about making things for my babes is they are always happy for hand me downs. I have never sewn or knitted something for The Boy that my Girl isn't happy to receive- batman shorts, bucket hats, vests- you name it and if big brother has worn it she is happy to take it on. These are simple- hardworking clothes that are made to be played in- gotten dirty- and adventured in- these are the layers of childhood! 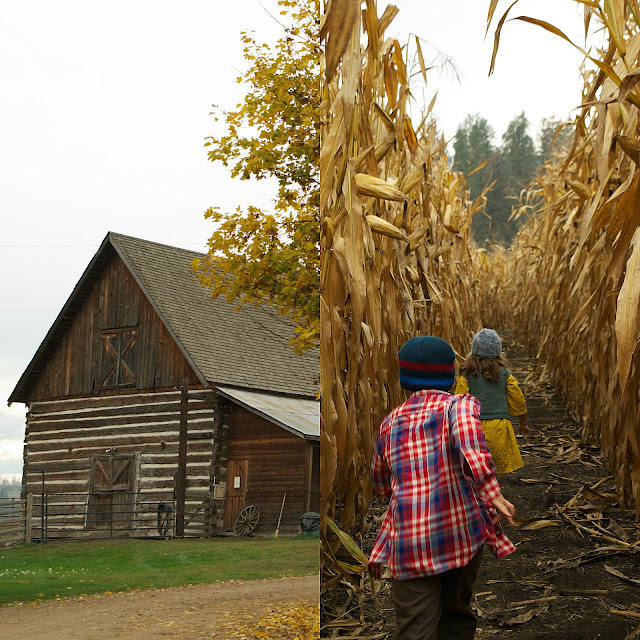 On a recent trip to the North Okanagan it was decided that a trip to the corn maze at O'Keefe Ranch was a must. The skies were hanging low and rain was threatening but our Littles were admit that I would love the ranch( I didn't have the heart to tell them I visited as a child) and that the corn maze was a-maze-ing! Get it? Hillarious I know! So we piled into the van along with my Father In Law and fully expecting to get soaked but trying to stay optimistic. 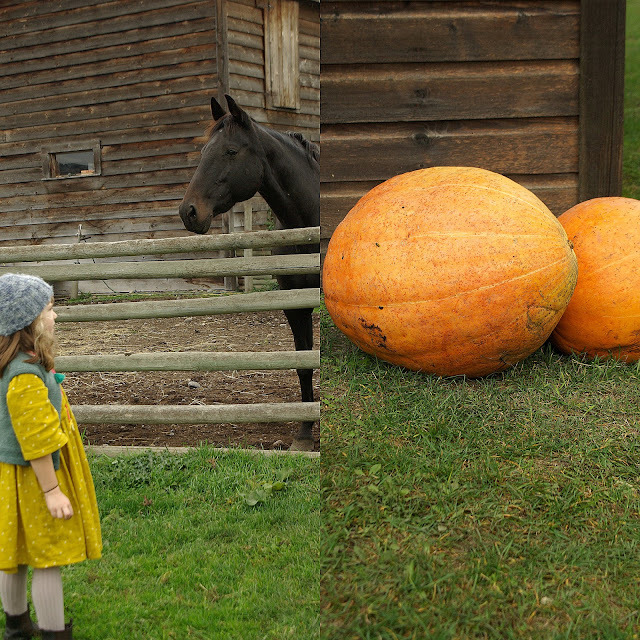 Upon arrival at the ranch we were delighted to find horses to ride, kittens to love on and sheep to share secrets with. The Littles love to take any opportunity they can to get into the saddle- their Opa was a very accomplished equestrian rider once upon a time and he was happy to see both kids excited to ride. These city kids of ours are getting more time on horses than I ever did as a kid- and I grew up in a town where horses walking down the street was an every day occurrence! 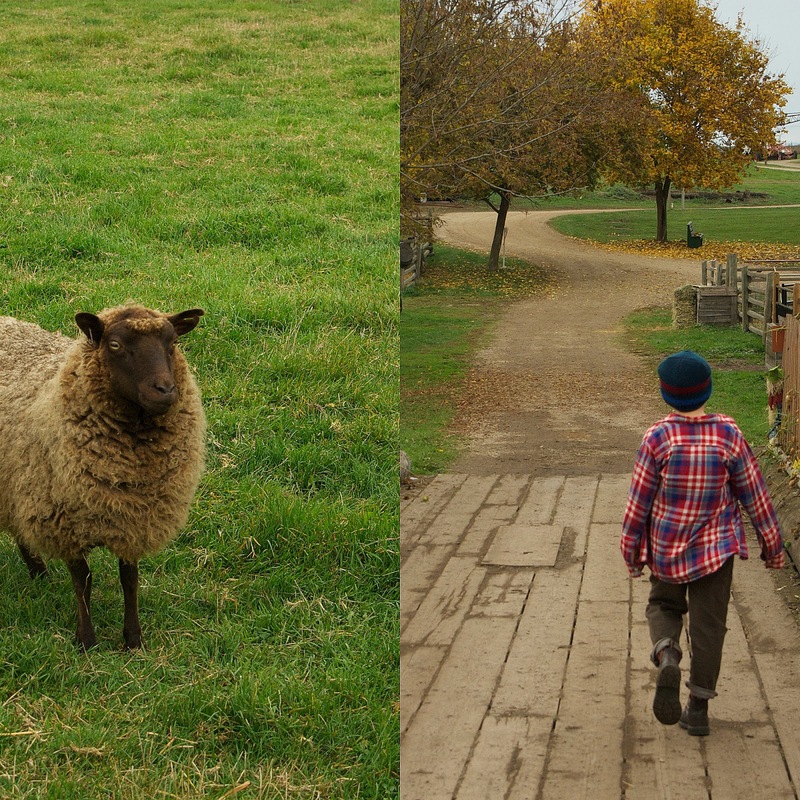 So horses, cats and sheep- oh and chickens- our kids were in heaven. The campaign for pets is reaching a fever pitch around here these days and this trip certainly fuelled the fires. O'Keefe Ranch is nestled in amongst the rolling hills of the North Okanagan just outside of Vernon- a few minutes from town. The end of the wagon road with a self supporting town O'Keefe Ranch recently celebrated it's 149th birthday. Primarily a tourist attraction today the ranch still retains much of it's charm and plenty of historic buildings that are open to the public to explore in season. 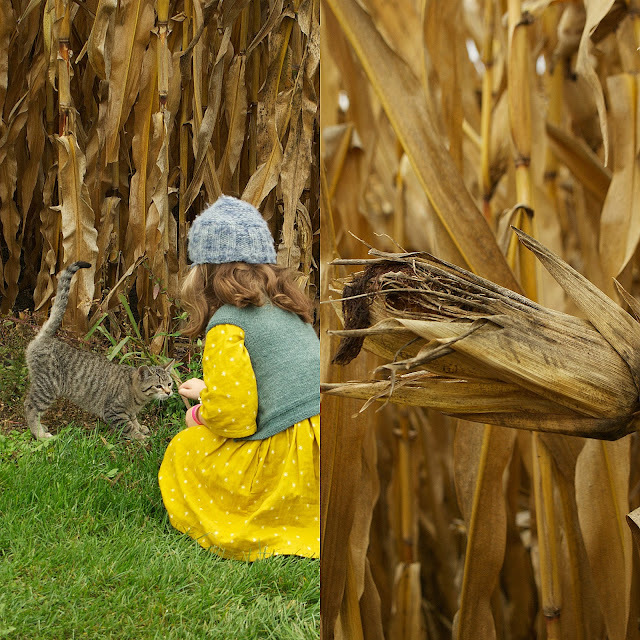 So we did horse back riding , followed by a trip through the corn maze- we played it safe and visited during the day- if one is brave enough to go through the corn at night be prepared to be terrified- but during the day it's all kitty cats and pumpkins! 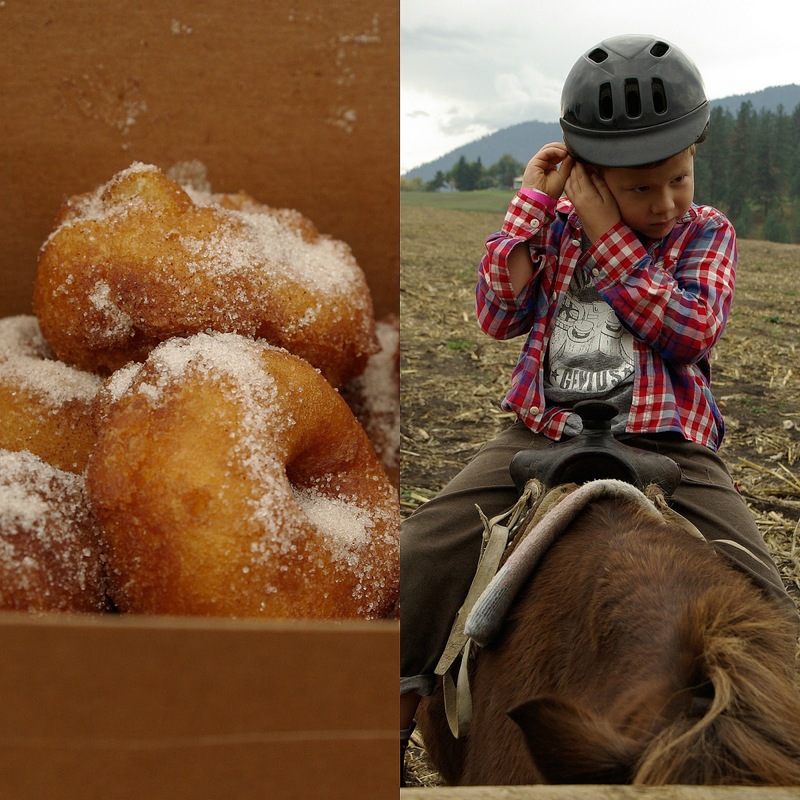 Once we made our way through the corn maze we sat by the camp fire and had hot dogs and of course mini donuts. With the rain holding off until we were safely on our way home we enjoyed our time at the ranch through and through. What I loved best about the set up at O'Keefe Ranch was the amount of space- not the overwhelming crowds one finds at the Coast when trying to do anything seasonal! With their bellies full of mini donuts and heavy eyes threatening naps our Littles declared O'Keefe Ranch as having the best corn maze ever- it was a-maze-mg! P.S. because I know folks will ask Miss Lo's dress is the Gardinia dress pattern from Cali Faye Collections- sewed out of a ever so soft piece of Cotton & Steel double gauze- I will likely write about the dress details in another post- for now it's all kitten & horses! So technically I am tardy to the party- we are actually in week two of Slow Fashion October but I was so busy with the knitting last week that I did zero writing! Here we are- as I said- in week two and we are talking small- small batch/ capsule wardrobes/ indie designers/ handmade/ living with less- you get the idea. Since I have written quite a bit about my handmade wardrobe I thought I would share a few of my favourite small batch/ indie designers that-in addition to my handmade wardrobe- are amongst some of the hardest working items in my closet. I do still shop but these days my store bought purchases tend to be fewer and further apart. They tend to be higher quality which generally means a bit more expensive but when I consider the hands making my clothes are able to make a living I think it's worth while. it's important to me that the pre made items I do purchase are going to last- that they are timeless- and will last many seasons. One of my favourite brands is Uzi NYC- I love their clothes- they are beautifully made and last forever! Most days you can spot me in one of two Uzi tops, my thrifted Levis and my Birks- I could live forever in this outfit! Along with my trusty Ghanian basket- I purchased this in the spring from Three Bags Full and it has been life changing! Living in the Pacific Northwest one of my biggest struggles has always been the weather- so October for me is usually poncho season- mine is from a local company Granted Clothing. I love Granted- they make the loveliest of Cowichan knit sweaters imaginable! In our often unreliable climate we needs fibres that can breath and still repeal a little water if it happens* to start to rain. Sun one minute rain the next- welcome to Vancouver- if you don't like the weather wait five minutes! Now shoes- my favourite- I love a good pair of shoes and these boots above are my oldies but goodies- these are the boots that make my look complete- feel good on my feet and stay dry. John Fluevog knows a thing or two about footwear- these have lasted almost eight years! I think sourcing sustainable footwear can be tricky- especially when you need something hardwearing and water proof(ish). For me finding something with timeless appeal that is built to last is the key to reasonable sustainability in this department. As previously mentioned living in a small apartment means we naturally need to keep our clothes to a minimum- over the years we have gotten better at reducing to create a simpler life. As things no longer serve a purpose they are given away and not replaced- creating an emptiness to be filled with nothing more than living. Stepping out of the rat race of keeping up with the latest trends has been pretty revolutionary and life changing for me- I've learned to trust my taste and cultivate my own style and somewhere along the way I've gotten excited about fashion again! *rain always happens- it's inevitable in Vancouver! 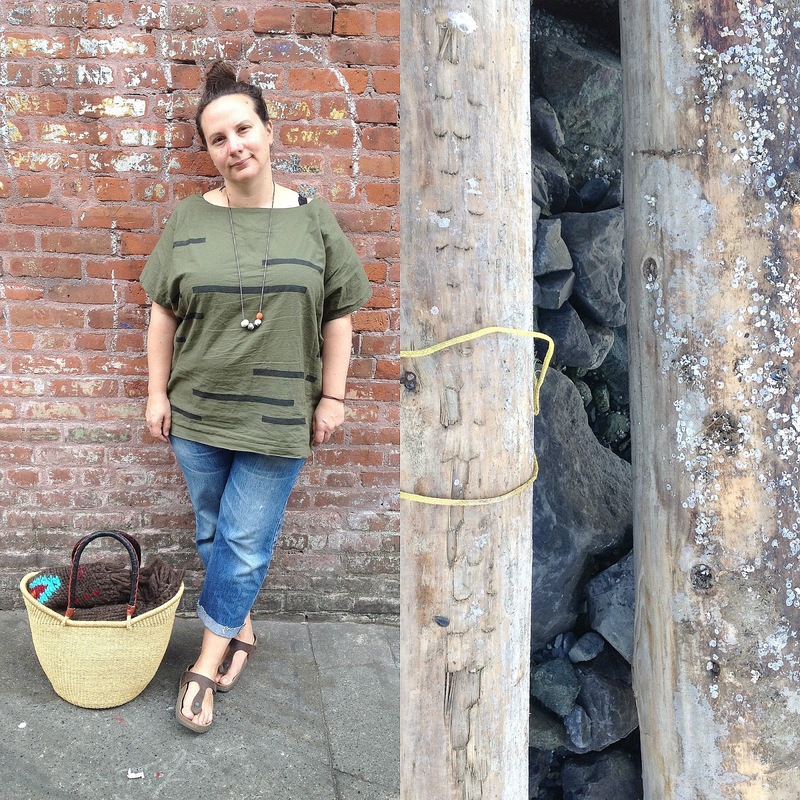 Last weekend my girly and I headed to fibre nirvana- also known as Knit City. 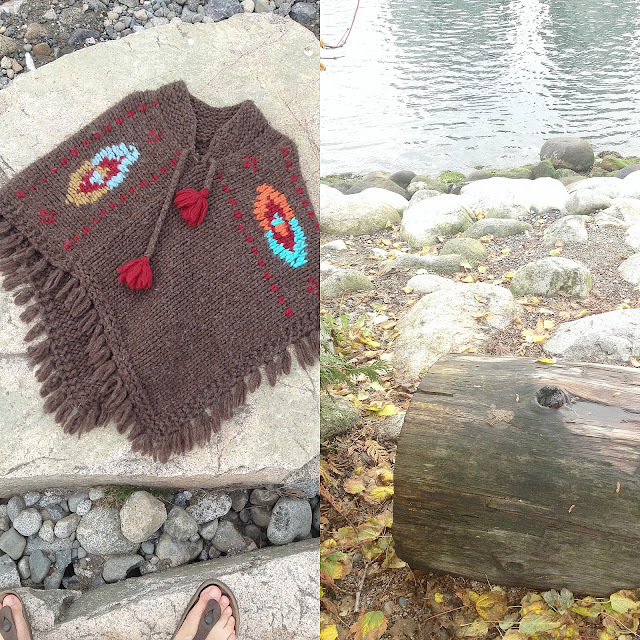 A gathering of local fibre folk from around British Columbia. 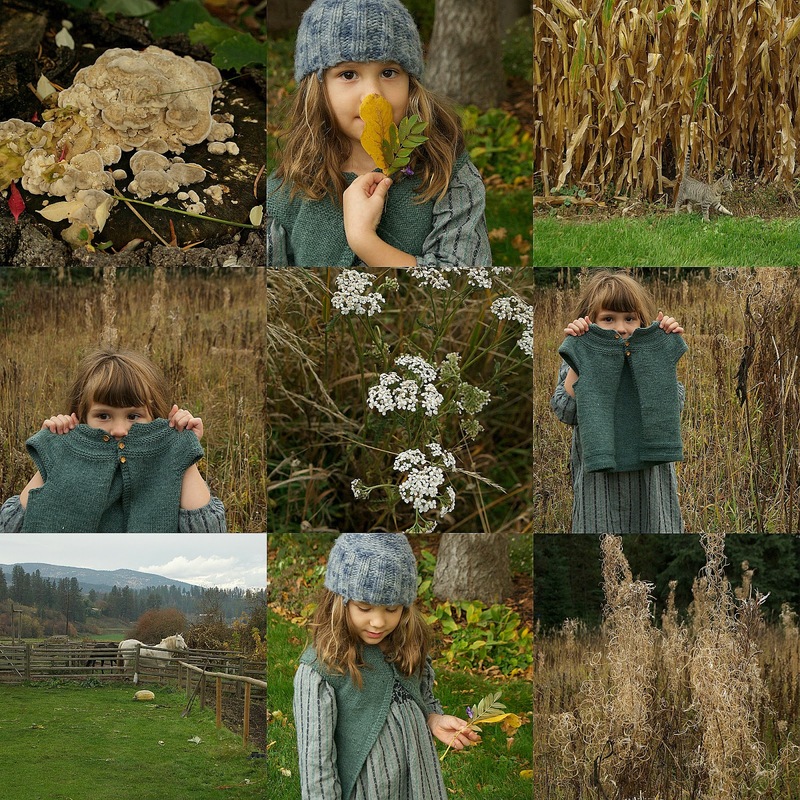 While my girl is interested in knitting and making things it cannot be denied that she was not interested in being indoors on such a glorious fall day- she knows sunshine is special and potentially fleeting at this time of year. So after we had a good look around we headed out to play under the massive Chestnut trees that tower overhead at the PNE grounds. We started by picking up just one perfect shiny chestnut a piece- but one quickly turned into many- which turned into an entire bag of nuts. Once you start it is difficult to stop. 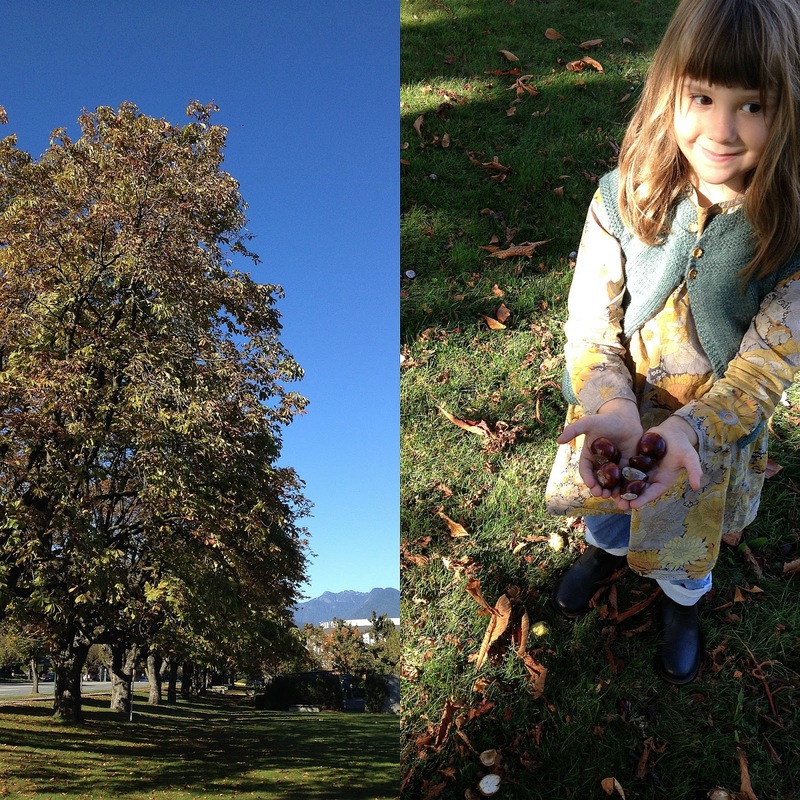 After a while I went and sat on a bench to soak in the sunshine and Miss Lo kept collecting and playing- quickly making up some elaborate bowling game- racing chestnuts down a hill- throwing them. Its so funny that even today- in a time of easy technology- children intuitively understand the universal appeal of a perfect chestnut. I've been thinking about this quite a bit lately- often I worry that I am selling our children short by raising them in the city- they don't have the freedom- imagined or not- that children in more rural areas enjoy. I try my best to sit back and let them have free play- but regardless I am there and they have yet to learn to truly play freely without adult eyes. I wonder do the advantages of living in the middle of a busy city outweigh the drawbacks? A few weeks ago I was parsing one of my favourite wooly blogs- Fringe Association- and I stumbled across the most wonderful of plans for October. 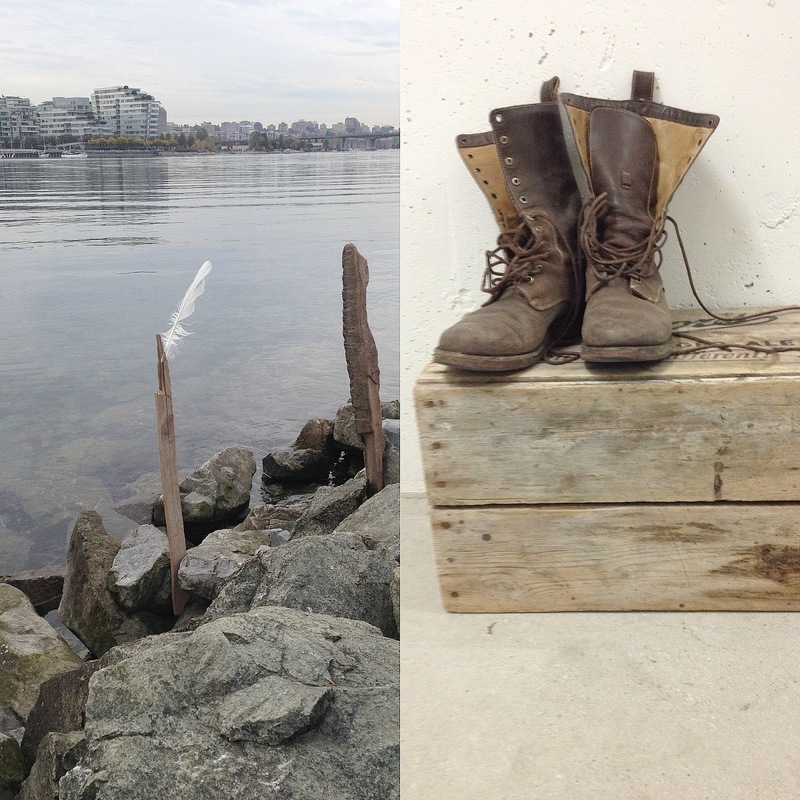 An entire month dedicated to talking about slow fashion- examining our consumption as makers- and potentially starting a conversation beyond our closest circles. Now it will really come as no surprise when I did a little happy dance and made room up on my soap box- for this is truly a topic near and dear to my heart. One could say that slow fashion and conscious consumption- textiles and having a chance to talk about making garments is my passion- it's what I get really excited about- making a change and being part of the solution. So of course I ruminated and obsessed for days about what I had to say in this first Slow Fashion October post- so many things to say yet how to speak with out having my words tumble out and pile up in excitement! So I thought I would start as most others are starting- talking about my road to becoming a maker- talk about why it's so important to me. I have written about my sewing journey a few times- born out of necessity and frugality my Grandma fought me to sew at a very young age. I vividly remember standing with her at her kitchen table while we drafted a dress for my favourite doll- she found a scrap of fabric and showed me that something can be made from nothing- I was hooked! My Mother also sewed- she sewed all of my sister and my clothing when we were children- Little House on the Prairie was a very popular look and that was my childhood in a nutshell. Although I have sewed and thrifted and tried to be as conscious of a consumer as possible- as ingrained by my Mother- I of course am no angel. I am guilty of buying t-shirts made in faceless sweatshops. I am guilty of over consuming my fair share. To be really honest it was only after the birth of my children that I started to really think about the source of garments and what they were made of. It was through sourcing ethically made organic clothing for my own kids that I began to realize how important it is to buy quality over quantity and I started turning that spotlight on my own closet. Today it's something we try as a family to be mindful of- we live in a small apartment and as my children grow our space shrinks. We live where we work. We eat locally and seasonally. It only seems natural that our clothing is gentle on the earth as well. As a maker my biggest step in the slower direction was to becoming more conscious about the textiles I was using. I was introduced to the wonderful slow fabric produced for a store local to Vancouver- Maiwa- and I was hooked. As soon as I started using the textiles from Maiwa it became evident the difference was not only in how they were grown- organically, ethically, slowly but in quality. Always a sucker for craftsmanship this sealed the deal for me. From there I started noticing locally grown and produced yarns. I became interested in natural dye techniques and learned about the harmful effects of conventional cottons and dyes. For me this month will be about using what I have- every maker has a "stash"- and I intend to track how I utilize what I already have. I'm working towards creating a capsule wardrobe- which will be small and perfect for me own needs. I am also planning on taking a look at and rethinking my relationship with Thrifting- something that has the potential to get out of hand for me. 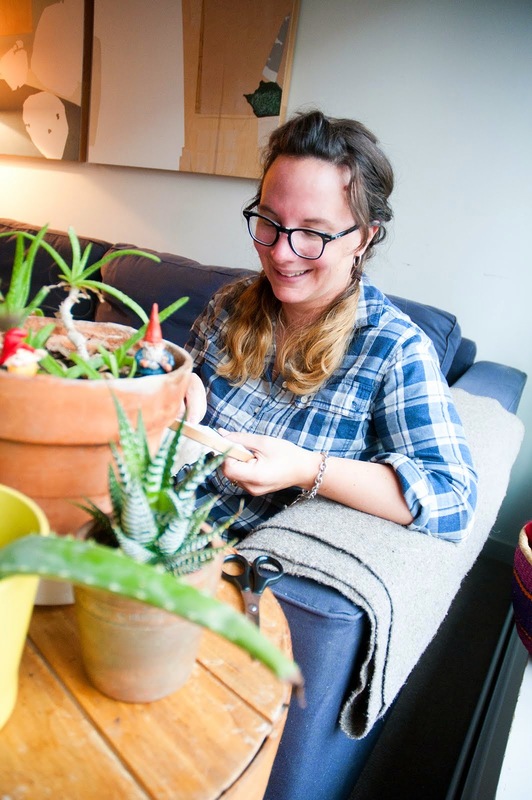 I think overall the one thing I am really excited about during this month of exploring slow fashion is starting a conversation- connecting with a larger tribe of makers- and seeing all the amazing handmaids of course!